BÌNH ĐỊNH — The central province’s environmental department has ordered three titanium exploitation companies to suspend operations, which have continued for the last three years despite expired licences. The three companies - Mỹ Tài Co Ltd, Tấn Phát Co Ltd and Ban Mai Production & Commerce Co Ltd - were only granted permission by the province’s People’s Committee to carry out mining activities until the end of 2013, according to Huỳnh Quang Vinh, deputy head of the Department of Natural Resources and Environment (DoNRE). Once this period was over, the local authorities asked the three companies to complete environment restoration at the exploited area by the end of August 2015. However, the three companies defied the order and continued to hire workers and deploy heavy machines to extract titanium at the site in Phù Mỹ District, prompting anger of the locals. Bình Định People’s Committee has told Phù Mỹ District to coordinate with the provincial DoNRE to work on administrative fines applicable for the offences according to existing law and seize all machines and other assets for further investigation. In a related development, locals of Vạn Thái Village in Mỹ Tài Commune of Phù Mỹ District have submitted a denunciation letter against Hoàng Khiêm Co Ltd, saying the company has illegally exploited sand in the riverbed of the La Tinh River from 2016 to now, without licences. The overexploitation of sand has led to heavy erosion on the riverbank, adversely affecting lives and production. 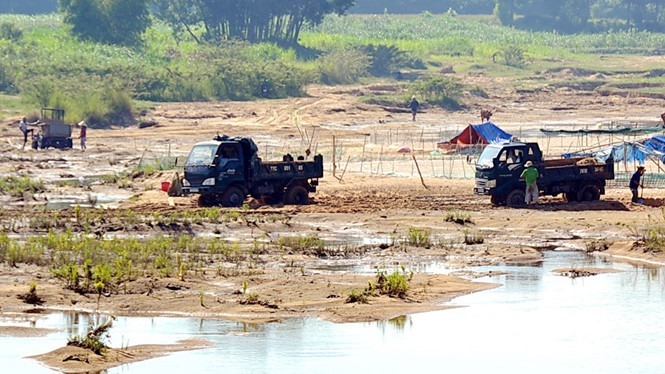 Phù Mỹ authorities said the province is still processing Hoàng Khiêm company’s documents asking permission to carry out mineral prospecting, specifically sand used in construction, on a 2.4ha area. However, the company has gone on with exploitation operations without obtaining any licence.